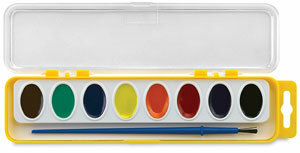 Sargent Art-Time Washable Watercolors are a super buy for home or classroom, created especially for younger artists! Washable for easy clean up. Class Pack of 36 — This pack contains 36, 8-color sets that each include a soft bristle brush. Colors include: Yellow, Orange, Violet, Red, Green, Blue, Black, and Brown. Set of 8 — Colors include Yellow, Orange, Red, Violet, Blue, Green, Black, and Brown. Also includes a brush. Set of 16 — Contains the same colors as the Set of 8, plus Pink, Red-Orange, Light Blue, White, Red-Violet, Blue-Green, Yellow-Green, and Orchid. Also comes with a brush. Super Size Set — Extra large paints in Red, Yellow, Blue, and Green. Includes a brush.